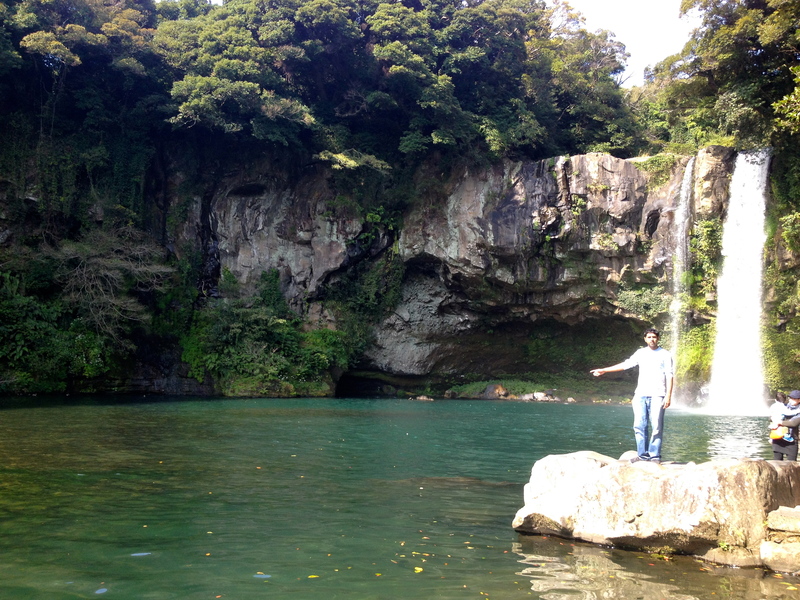 My most recent outing in South Korea has been the best thus far to Jeju Island. Jeju Island is a volcanic island in the shape of an oval that measures 73km from west to east, and 31km from north to south. As Korea’s most southern region, the weather on Jejudo Island remains significantly warmer than the mainland even during the cold winter months. Below are the day-to-day activities done. For about a week I kept hearing about how great Jeju Island is. I wanted to go and view the scenery and explore! Last Friday (18th) was a school holiday so at the last minute myself and two other amazing travellers, Paulina from Colombia and Centennial’s own Urooj decided to go. Yes, last minute! 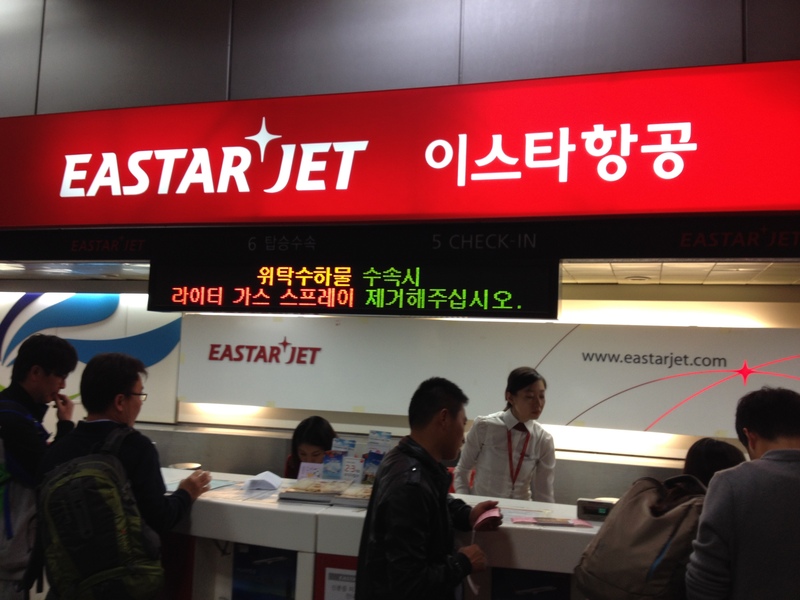 Thursday at 1AM we booked our flights and left late afternoon to Jeju Island. The flight was only 1 hour. As soon as we landed we scrambled to look for a route to get to a guest house to sleep. Once we got there we were hungry and everything was closed but the owner was very nice to help us order pizza. We then passed out as we had to wake up early the next day. At Gimpo International Airport, Seoul, Korea. Waiting in line to check-in. 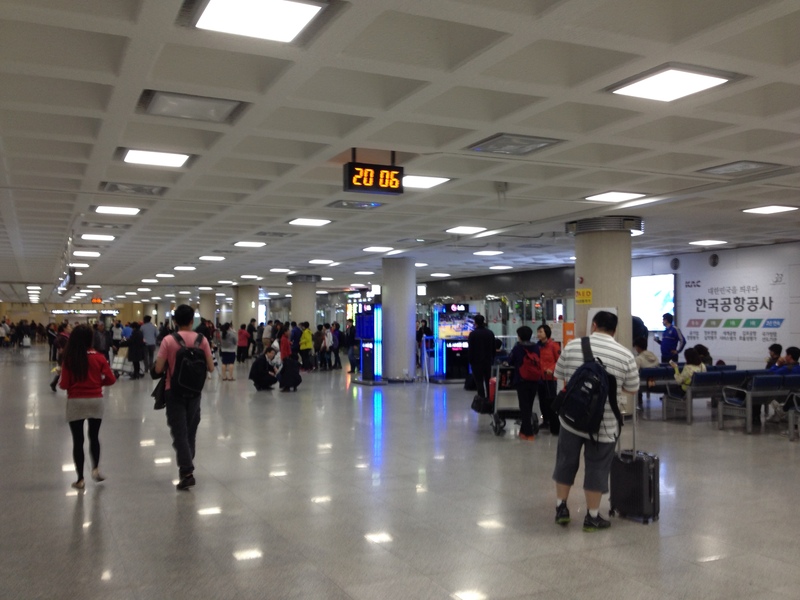 Arrival at jeju International Airport. We woke up early to get ready as we had a few things to go see. There happened to be another person there who was also touring the island himself so we asked him to join us. His name was Brandon and took a semester off from Aussie Land to tour mostly Japan and a little bit of South Korea. More people, better company, lots of fun! The first stop we made was Manjanggul Cave. Manjanggul Cave is one of the finest lava tunnels in the world, and is a designated natural monument. Manjanggul Cave has a variety of interesting structures inside including 70cm lava stalagmites and the lava tube tunnels. Only 1km of the 13,422m Manjanggul Cave is open to the tourists. The inside of the tunnel sustains at a temperature of 11~21℃. It was really nice to see. 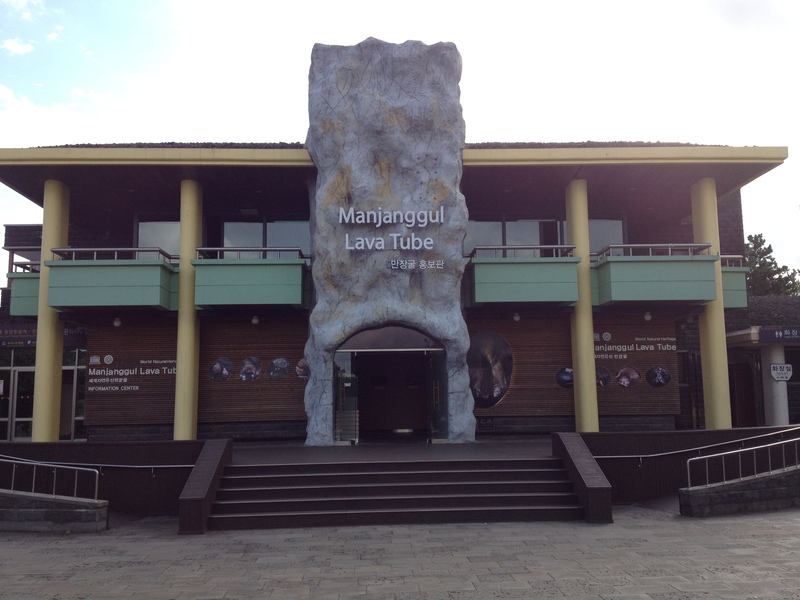 Manjanggul Cave & Lava Tube information centre. After the cave we walked a short distance to Gimnyeong Maze Park. It was really beautiful and nice. There was one entrance and inside different paths as we had to find our way to the middle. In the middle there is a bridge where we climb up and ring the bell which lets people know you made it. It was hard for me to find and I’d follow school children to get there but could not find it. I did find the bridge but not the entrance to it so with help of the local school kids I climbed up. It was pretty funny! 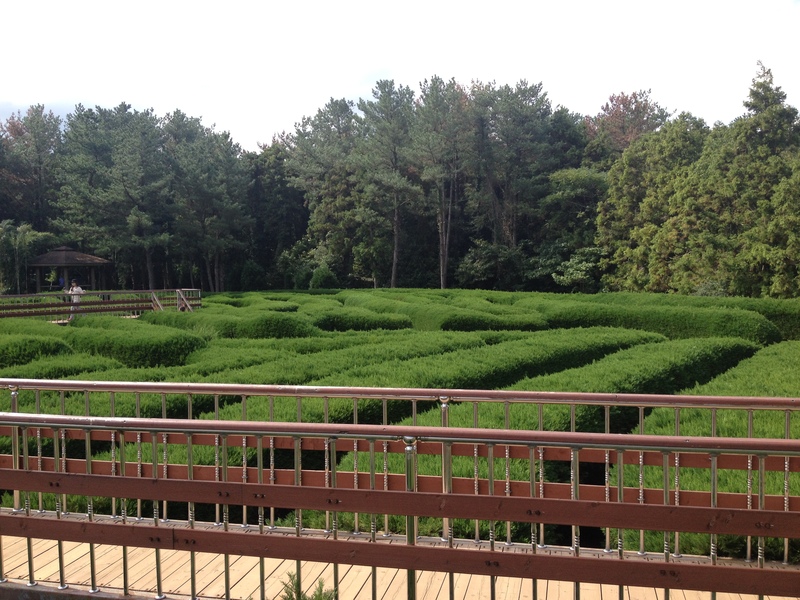 Once up the bridge you see amazing views of the garden maze, phenomenal! The view on the bridge once you have found your way to it in the maze. Took us a while but we made it. The next place we wanted to visit took us a while as we did a bit of walking and taking local transit. This place was called Udo Island! Its a very small island with amazing views, beaches and great ice cream. We had to take a 15 min ferry to Udo Island. When we arrived we were wondering how to get around. One place caught my eye. A small rental shop had scooters and ATVs parked outside. And yes of course we chose to rent ATVs to tour the island. We were ecstatic and felt like little kids. We had them for two hours and did the entire tour including stops and taking pictures! 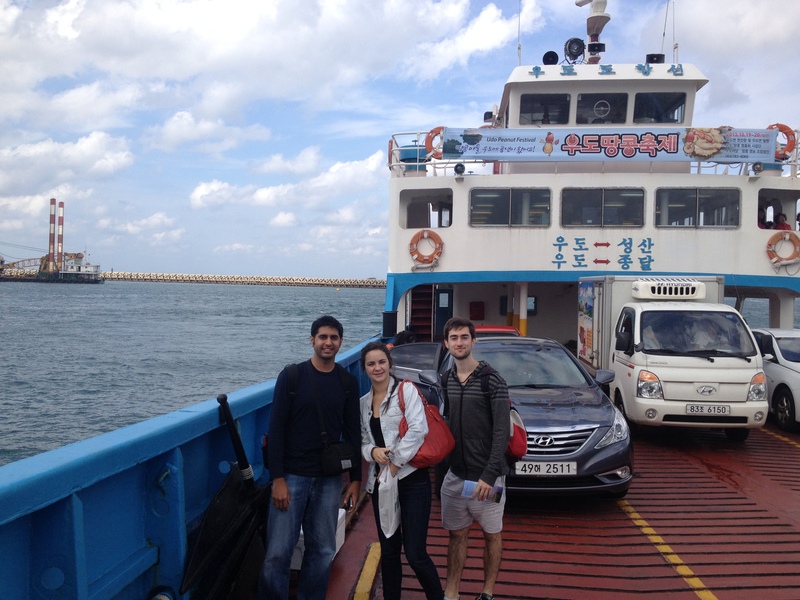 When we returned the ATVs we got lucky catching the last ferry back to the port in Jeju. Short Ferry Ride to Udo Island. Rented ATVs to get around Udo Island. Best method of travel! We had a two hour bus ride early morning to the south of the island. There was lots to do and see but we saw what we thought would be worthwhile. 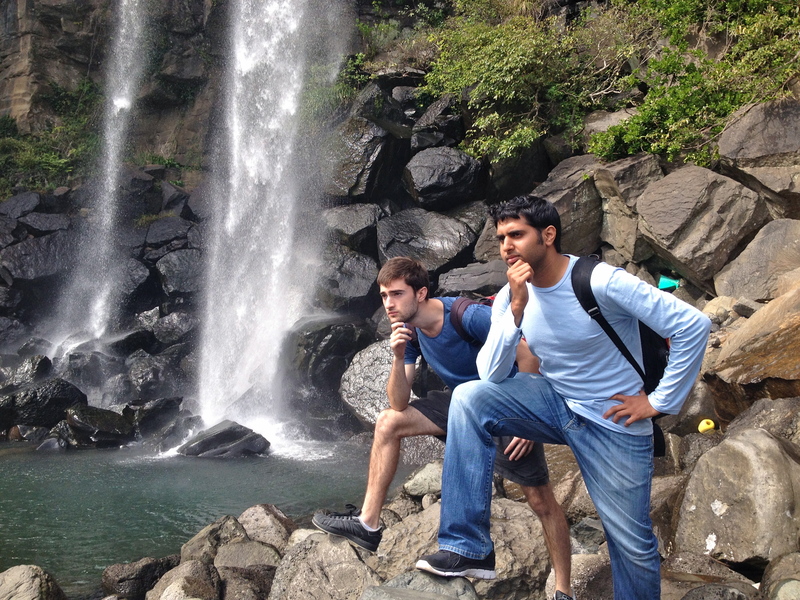 We saw two falls, Cheonjiyeong falls and Jeonbang Falls. They were really beautiful and can get close to the waters. 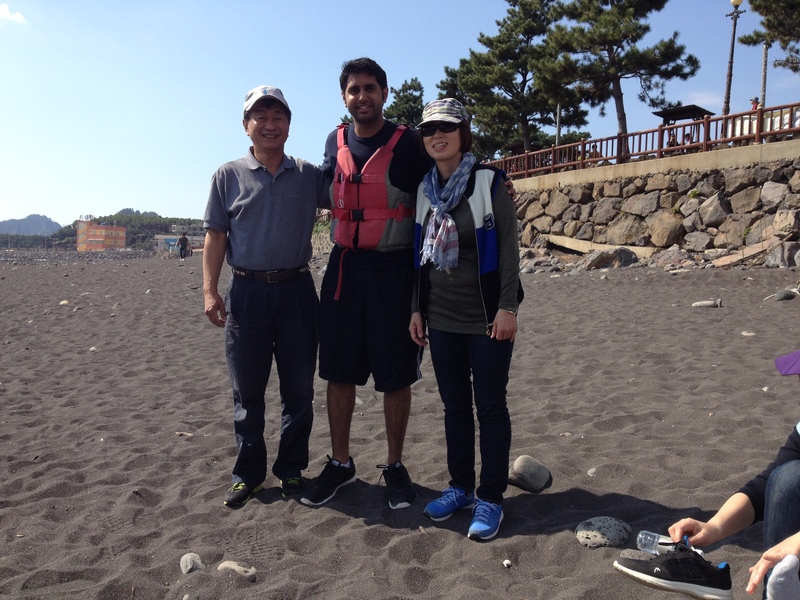 After visiting the two falls we went to the city of Jungmun and relaxed on the beach and enjoyed the nice views. We also had time to see an animals show. 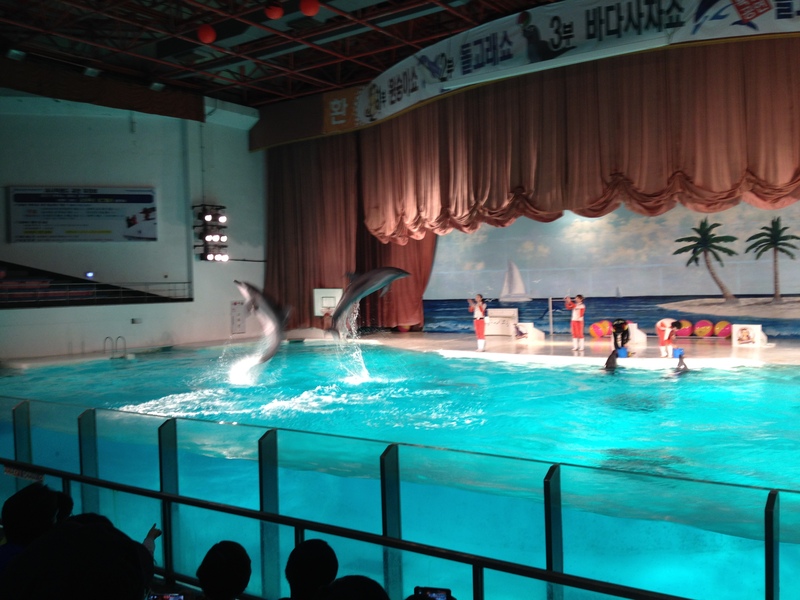 In the show they had dolphins, sea lions and monkeys! It was nice. It is amateur to the standard of tricks in Canada but still fun to watch. 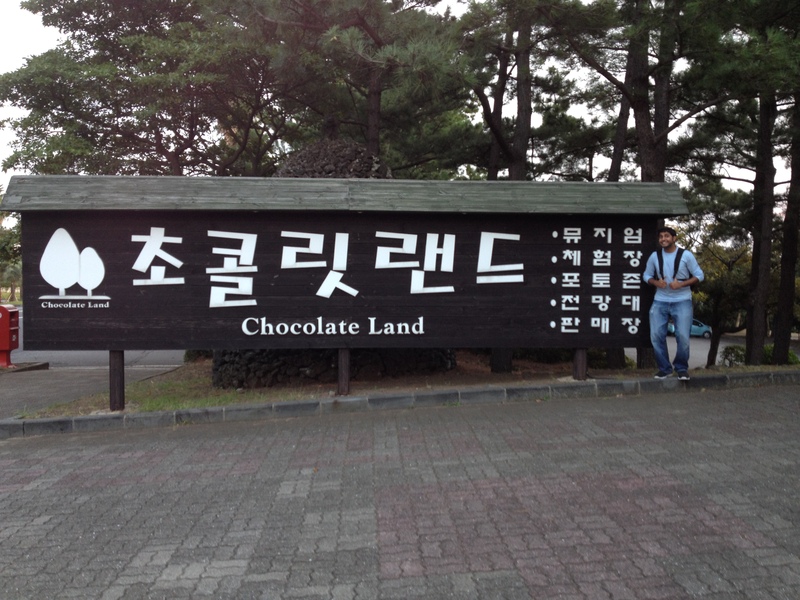 There was a place close by called ‘Chocolate Land’. It was a small chocolate museum. Very interesting as it had chocolates from all over the world. Myself and Aussie mate Brandon tried posing like Captain Morgan! My love for chocolate! Had to go check it out. Today, was pretty much a relaxation day. We got tickets to do a bit of kayaking but had to wait about 3 hours for our turn. To kill time we had breakfast then relaxed at the beach and mingled with locals skipping rocks. I was pretty good at it with some people asking to play along and take pictures. Very nice. We got ready for kayaking and it was a 30 min course. 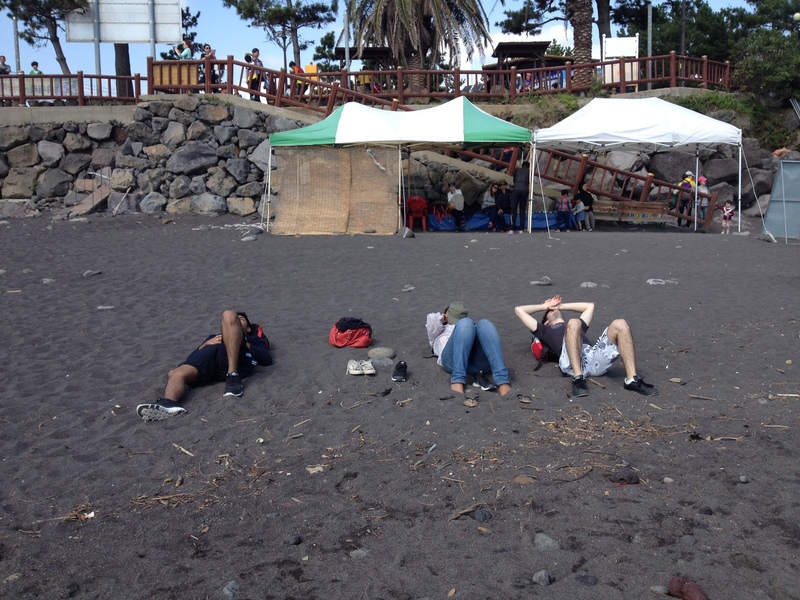 After kayaking we headed back to the beach we saw the day before and relaxed for hours. I even took a dip into the ocean and went quite far. The weather was perfect and hot for this activity. Hung out with the locals. 4 hours at the beach! Relaxation! 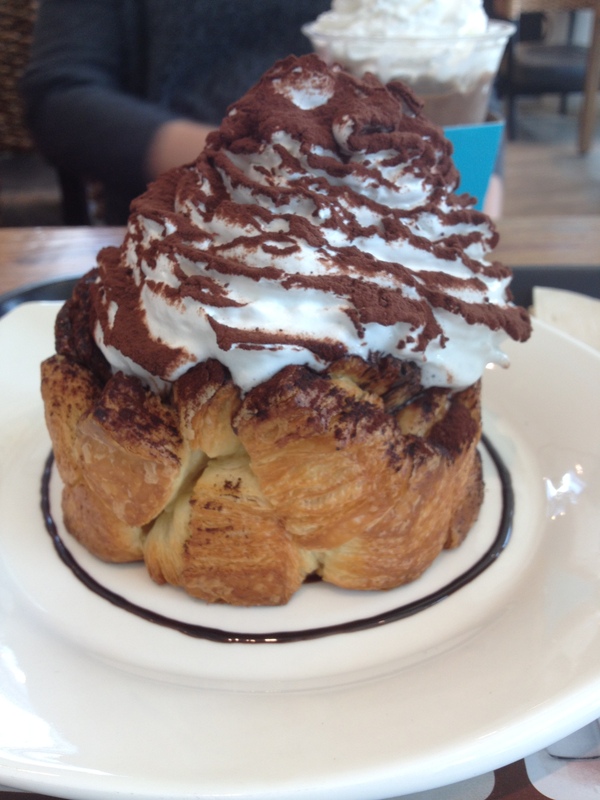 We had to catch our flight back to Seoul city at noon so I did not do anything except reward myself with a chocolate pastry at Cafe Bene after check-in. And when I arrived at Seoul city, from the dorms I changed and went to the spa! Overall it was an amazing trip. I was worried about taking taxis to everywhere we wanted to go but we were perfectly fine with local transit. Another great story to this was that not once did a single rain drop fall. On Sunday we hung out at the beach most of the day, it was supposed to rain but did not. As each and every day that passes I know that I am learning something new; whether it be a word or an experience. Its really great to step out of your comfort zone and challenge yourself.